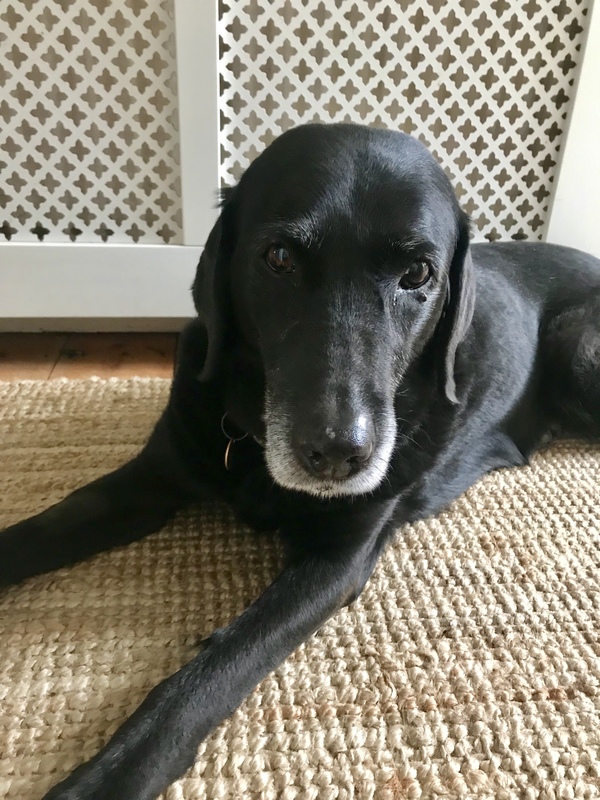 Among the ‘New for 2019’ dogs was Vintage Girl Rokit, a 13 year Lab who was referred to us by Guy of Coastway Vets with generalised osteoarthritis and stiff back. She also has Cushings and Vestibular Syndrome as well as a cyst in her neck. But she still manages her walks in the countryside every day. Why Rokit? Because she was very speedy when she was a puppy and her younger siblings couldn’t spell Rocket – hence Rokit. I was told she can be a bit wary of new people who are touching her. But she rather seemed to take to me – putting her head straight down and shifting her body so I could get to all areas. I think she even knew what I was saying. “If you can’t get to the side she’s laying on, don’t worry – do that side another day” I said. To which she rolled over giving me access to the ‘other side’. Dogs are brilliant. Her Mum is a human massage therapist so had all the skills but just needed to think of Rokit, not as her best friend when working with her, but as a client. That way all her massage intuition and experience will flow naturally. Intention, intention, intention. So important. You can’t play at massage. There is not a prescription that fits every dog. It doesn’t follow the same pattern. You need empathy. You need the dog to know you’re there to help and not play. Using her existing massage skills and looking at her in a new way, Rokit’s Mum will be able to carry on all the good work. This entry was posted in acheypaw, achy paws, AchyPaw, achypaw myotherapy, arthritis management, canine arthritis, canine arthritis management, canine myotherapy, canine myotherapy, dog myotherapy, achypaw myotherapy, myotherapy, achy paws, Dog, Dog massage, dog myotherapy, multimodal therapy for dogs, myofascial release, myotherapy, senior dogs, south coast dog massage, south coast myotherapy, trust and tagged acheypaw, achy paws, achypaw, achypaw myotherapy, achypaws, arthritis management, canine arthritis management, Canine massage, Dog massage, dog muscle therapy, myotherapy, south coast dog massage, south coast myotherapy, www.achypaws.com. Bookmark the permalink.